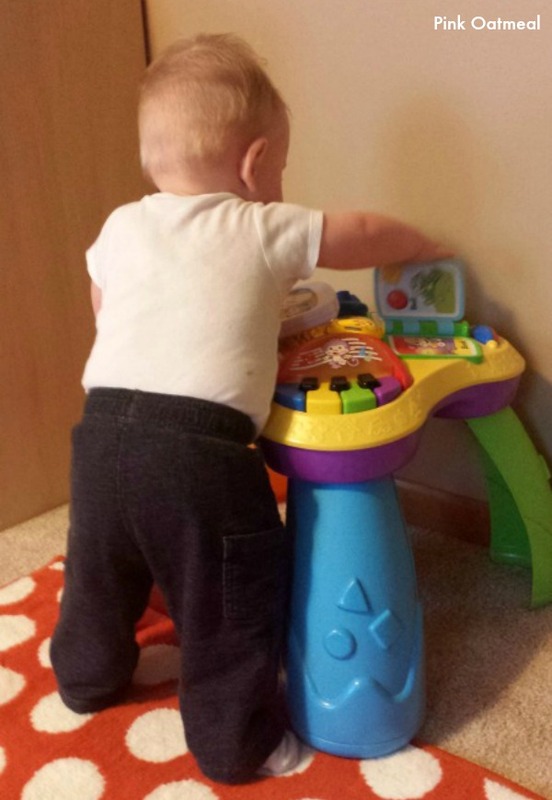 Pulling to stand is a developmental skill that takes place in baby at approximately 9 months of age. 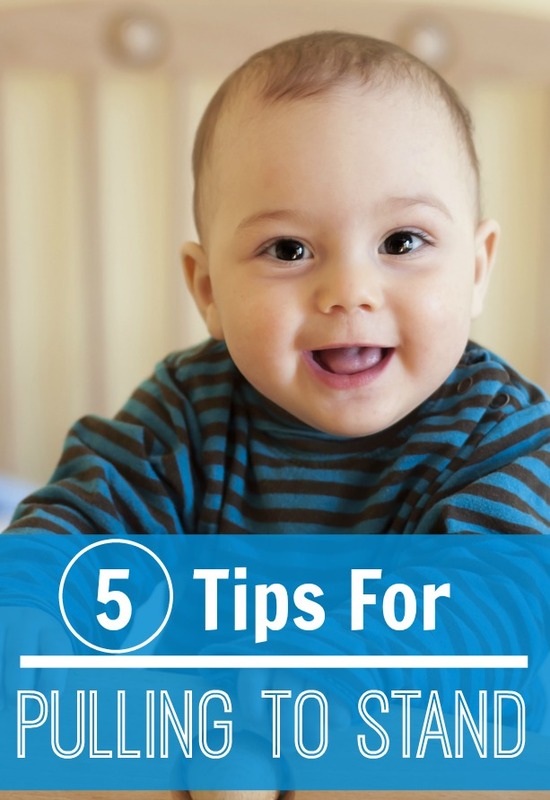 Here are 5 fast and easy ways to play with your baby that will promote pulling to stand. This post may contain affiliate links. I only recommend products that I love or personally use. Tummy time is the basis for laying down the foundation of skills necessary for baby to pull to stand. Tummy time should be started from day one and done every single day several times a day. I know tummy time isn’t always a happy time for baby. 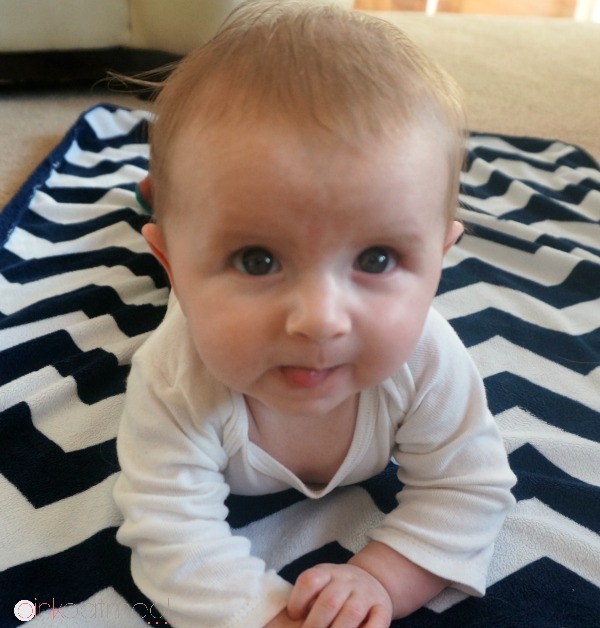 Be sure to check out tips to make tummy time easier! A couch cushion or large pillow work great for this. This is great to use when baby can’t quite hold themselves up on all fours on their own. The slight elevation makes it easier to feel their body in this position but limits the amount of gravity they are working against (think of doing a push-up on the wall versus the floor). They are working on the necessary core strength needed to pull themselves up and also getting a feel for where their body is in space in this position. Make sure that you have a fun toy for baby to play with in this position! Once baby does pretty well on playing on the couch cushion/pillow start encouraging baby to pull up onto the couch cushion on their own. Placing a toy on the surface is great motivation. Get down on the floor with baby for encouragement. Think of where you pulled that cushion off the couch. It’s a great spot to challenge baby to pull-up just a little more. If your couch is too high you could try two cushions stacked together leaned up against a supportive surface. Look for a position that get’s baby close to playing on high knees. 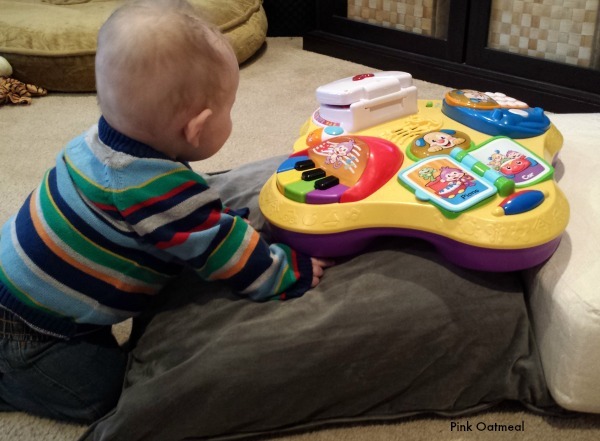 Find a position where baby will be comfortable accessing the toy in a standing position. 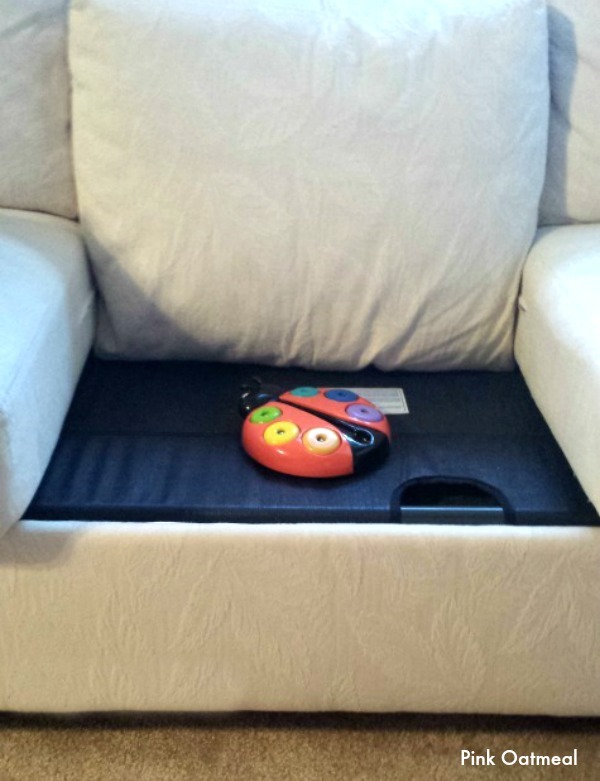 Maybe you need to add the cushion back on the couch or if you have an activity table (my favorite) for baby it is usually a great height for pulling to stand. Place a toy that your baby loves at that height for encouragement. Let’s connect! Pink Oatmeal is on Facebook, Pinterest, Twitter, and Instagram! Get everything you need to make physical activity and motor planning fun and easy. Pink Oatmeal offers memberships for full access to videos, members only products, and annual members get ALL of Pink Oatmeal’s resources to use. Don’t miss out on this opportunity to add movement to the day everyday. Get started today! This website, shop or anything associated with the Pink Oatmeal LLC should not be used in replace of medical advice or treated as medical advice. The purpose of this Pink Oatmeal, LLC is for education only. If you have a medical condition or need medical advice please contact your physician. Any participation related to this site or social media does not result in a physical therapist-patient relationship with Pink Oatmeal LLC or it’s owner. Pink Oatmeal LLC disclaims liability for any damage, mishap, or injury that may occur from engaging in any activities or ideas from the website and/or purchased or free activities and printables. Please see <a href=”https://www.pinkoatmeal.com/disclaimer”>full disclaimer</a>. My baby is 7 months and she keeps on “climbing” over pillows. What age do you recommend starting the elevated surface step or how can I tell when she is ready? She is a little over six months, has good neck and head control, does very well in a bouncer and exersaucer, hates tummy time though. Thanks! Love your blog-so extremely helpful. Hi Hilary, I started it when I could put my son in that position and he could maintain his position without me having to hold him there. Of course, I was right there but wasn’t worried he was going to tumble over. He maintained good head and neck control and was able to play with a toy in that position. It was a little bit of trial and error. Thank you for this! Do you have articles on helping baby sit up?